The answer seems kind of obvious, right? If you shoot first and it’s fatal, you won’t be able ask questions later. The idiom itself is extremely reactionary. My interpretation is that someone who shoots first and asks questions later is likely reacting to an intense fear of a perceived imposing, immediate threat. Certainly there may be circumstances in life when shooting first is the best option and I’ll let you, the reader, determine what they may be for yourself. Where I strongly believe “shooting first” is NOT the best option – actually, for me, it is never an option – is in making healthcare decisions. The advance care planning geek in me is ecstatic to have found this resource! I plan to download the entire collection of PDFs for use with Caring Choices clients. I encourage you to share this site with people you love and your healthcare team for better informed, shared decision making. How will it hurt me? How will it impact my quality of life? How much time do I have to make a decision? What evidence does research provide about it? Shooting first and asking questions later is a gut reaction. In healthcare options and decisions, we need to be consulting more than our gut. As individuals, we are the only one going through the physical act of a test, treatment or procedure. However, we are encumbering those we love with the emotional and psychological outcomes of the test, treatment and procedure. These outcomes may involve complex and complicated caregiving, especially in later years. It will be important to know the how-what-why-when-where of caregiving needs when making decisions. Get informed about tests, treatments and procedures. Then, choose wisely. Caring Choices understands that time can be of the essence when needing to make healthcare decisions. We know that there are times when following our gut makes sense. We also know that sharing conversations about healthcare options and decisions provides a sense of security even if we don’t all agree on the course of action. Making your decisions known to your loved ones and healthcare team will prevent them from the reactionary shooting first and hoping to be able to ask questions later. This entry was posted in Advance Care Planning, News/Commentary, Resources on March 29, 2015 by Cindy Moyer. I saw this phrase in a newspaper article this morning and realized I’d grown weary of its use. Unfortunately, “patient-centered care” is so abundant in our language that it seems to have become simply a buzz slogan in healthcare circles. So many institutions use the expression to market their brand of care. An internet search reveals 6,780,000 (yes, millions!) of “hits”. 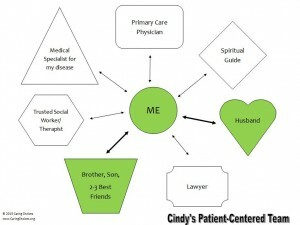 Internet images of patient-centered care, show various “wheels” with the patient placed directly in the center hub with spokes for the variety of individual care providers branching out from the patient. (This is my personal “wheel”.) It all looks good on paper/screen but it must be put into action to be effective. For many of us who work in healthcare, “patient-centered care” has deep meaning. We strive to provide the best care we can to each of our patients (residents, clients – whatever we call the people we serve) based on the individual’s needs, symptoms, wishes, and goals. Many of us believe that healthcare works best when plans of care — treatments, therapies and medications — are specific to the individual and not a broad-brush application based on generalized assumptions or measurements dictated by institutional protocol. A few days ago, I attended a very informative seminar on Alzheimer’s disease and dementia care. Every point the trainer made focused on patient-centered care for the patient with dementia. Because there are at least 80 different types of dementia, the need for specialized, individualized plans of care become very important. My trainer repeated a phrase often in her presentation: “When you meet one patient with dementia, you’ve met one.” Which is to say that not every person with dementia will present the same way or respond to the same kinds of care. Some will be aggressive, combative and belligerent. Others may be meek, mild and withdrawn. Most may share a symptom or two like forgetting how to do simple tasks, or be unable to express their needs. In the world of dementia care, patient-centered is obviously paramount. I believe this type of care planning should be applicable to all disease states because if you’ve met one patient with (fill in a disease name), you’ve met just one. One person. One single individual with very different values, beliefs and needs that differ from the next patient with a similar disease. We need to move away from the buzz. In order for actual patient-centered care to work, patients must become active in their health care planning. As patients, we need to be knowledgeable about our options, understand consequences and impacts, and make decisions. We must ask questions of our healthcare team. Discuss options and alternatives to care. Discuss pros and cons of medications, treatments, surgeries, etc. We need to talk about future healthcare concerns now and prepare our family/friends for truly patient-centered care – making decisions based on our values, beliefs and goals, especially when we can no longer speak for ourselves. Caring Choices advocates for true patient-centered care by encouraging (and supporting) individuals to talk with their family, friends and trusted healthcare providers and share choices they would make in future health/aging scenarios. Most people already know what kinds of healthcare situations they would not want to be in. The time to speak for ourselves is now, when we’re healthy and able to do so. This entry was posted in Advance Care Planning on March 15, 2015 by Cindy Moyer. In the never ending search for blog topics, I find myself listening, reading and talking with the hope that something I see or hear will stand out as an interesting point to try and share. This week Cindy suggested she had heard something in my music from a song entitled Traces Exist, which has inspired me to write about an idea that the line “struggle to exist” triggered. We all face certain responsibilities in life that are actually mandated to us from laws beyond those of conscience, ethics and morals. We all must pay tax on income. We must purchase car insurance if we choose to obtain an active driver’s license. We are even asked to obtain health insurance with the prospect of being fined if we are caught without. What struck me today was that there seems to be no responsibility designated to anyone to have advanced care and end of life discussions, despite the growing concern for costs related to the care given during aggressive or prolonged end-of-life care. There are often no improved condition parameters or attainable goals set forth which govern the extent to which treatments for prolonged illness proceed. Hoping for more time when faced with the end of life appears to be the focus without regard for quality of life, cost considerations, or relief from symptoms. Is length of time really all that matters? 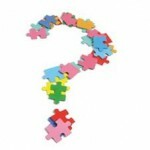 Perhaps the questions are too difficult to process, the answers to varied, complicated or vague to comprehend. Humanity simply survives. But more than once in my career I have heard people say “We treat our animals better.” There is no guarantee that treatments, procedures and new advancements in technology and medicine will ever eradicate the immediate needs of the person faced with the already weakening muscles, disrupted digestion, and pain-deprived sleep. The impact of the finality of death affects everyone involved. From physicians to families of the patients, all feel the pressure to apply the best state-of-the-art processes to prolong life and “beat” death. But we cannot ultimately win. And so we “struggle to exist” in a state of suspended hope that a miracle will occur and maybe this next pill, next surgery, or next infusion will be the one that wins the fight. And I do know that miracles can and do happen – sometimes. Caring Choices also hopes for the miracles that relieve the struggling of those faced with declining health no matter what the cause: natural aging, disease, or trauma. The final outcome for all of us is going to be the same. How we prepare for this is not going to become “mandatory”. You will not be fined if you do not talk about death. You will not be bothered at all by anyone. You will likely never even be asked how you feel about your own death until the reality of it is in your face. And as we all age that face becomes more familiar, and it takes on the shape of our family, friends, coworkers, and neighbors. Sooner or later it will be in your mirror. What will you say to your reflection then? Will you be prepared? Will you have peace and comfort as your priority? Or, will you struggle to exist? This entry was posted in Advance Care Planning, News/Commentary on March 8, 2015 by James Desiderati. 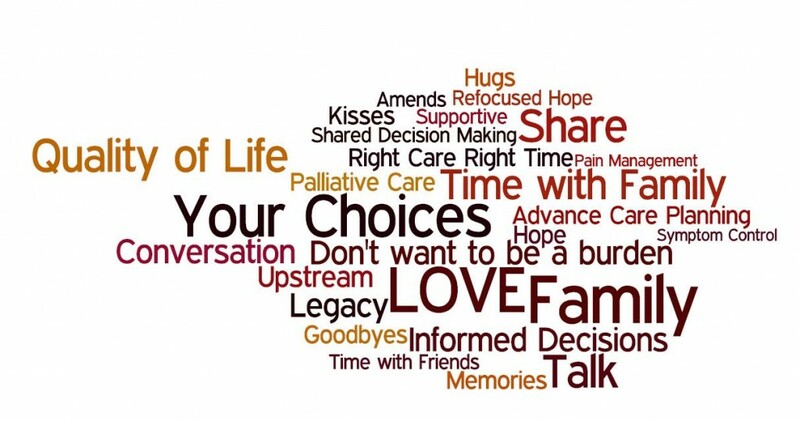 When I created this Wordle a few years ago for Caring Choices, I chose words that I believed helped to explain the concept of Advance Care Planning as well as words I’d heard from my hospice patients and their families. I hear similar things from my nursing home residents and their families. These words, though, are more than “mere” words on a page or screen. Some of these words represent what becomes important as people begin to face the end of a life – whether their own or of someone they love. Many of these words require heartfelt consideration and loving contemplation. Talking about some of the words may be downright frightening to some people; others may simply want to focus on LOVE and Family. Regardless of which word (or phrase) stands out to you in our Wordle, know that you can use that word (or phrase) to begin a conversation with someone you love. For instance, if your eye is drawn to “Quality of Life” you might consider telling your spouse, your best friend, your adult child (etc.) how you, personally, define that phrase. It will mean something different to everyone. But understanding your definition of that phrase will probably provide those you love with a good stepping stone for the next conversation. It may also provide a solid foundation from which your loved ones could make care decisions for you if you are unable to communicate or participate in decision-making. Someone else might focus on “Refocused Hope” and wonder what that means. Jim and I have used this phrase with our patients and their families on many occasions. Hope shifts from quantity to quality often in the concept of time, of relief from pain, and as simple as moments spent in quiet connection with one’s own thoughts. Hope becomes a desire for peace and comfort in place of “fighting” and “treatments.” Time comes to be more valuable once we see it as limited. This refocused hope may now be the opportunity to see a wedding, graduation, or birth in place of seeking a cure. “Shared Decision Making” is a main tenet of advance care planning and what our goal as Caring Choices is in working with families. While healthcare decisions are ultimately those of the patient (with advice from their healthcare team), the results of shared decision making benefit everyone involved. Sharing decisions ensures that loved ones understand how and why certain decisions were made so that they can confidently carry out your wishes without second-guessing themselves or delaying the kinds of care you want. Sharing decisions provides an opportunity to share fears and hopes, guidance and love. Words can be powerful things. When they are combined with action, they can change lives (and deaths). A couple of decades ago my lifelong best friend gave me a picture that we have hanging in a place that we see every day. It reads: “It’s the caring and sharing from beginning to end. It’s the trust and the time that makes a true friend.” Take the time to share our Wordle words with people you care about. Trust that you have the ability to start a conversation that will change your life … and death. Caring Choices – two simple words that can provide a loving connection between you and your loved ones. Use words to convey your values, beliefs and decisions to people you care about. Caring and sharing from beginning to end. This entry was posted in Advance Care Planning on March 1, 2015 by Cindy Moyer.